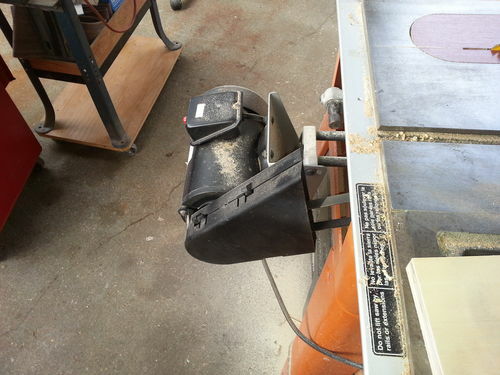 I got a Ridgid 3550 table saw a few years ago off Craig’s List. 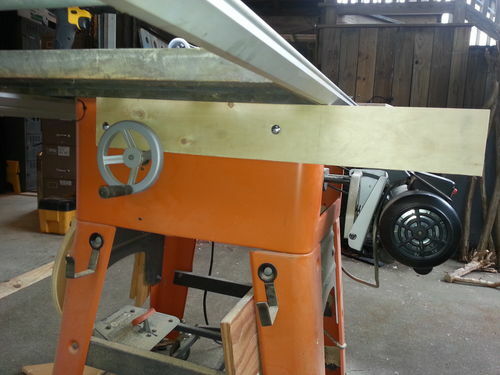 I like the saw, but I’ve wanted to do an outfeed table. Since the saw is on rollers I couldn’t go with anything too big. 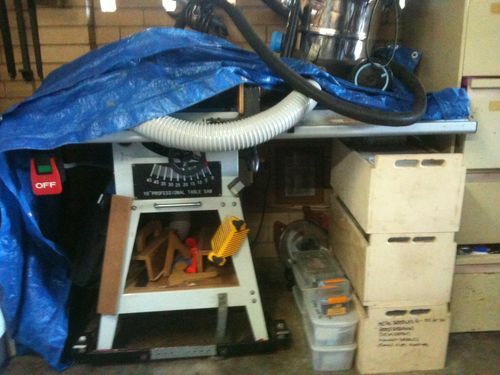 Also the saw is shoe-horned into it’s storage spot in the garage, so size was a consideration. 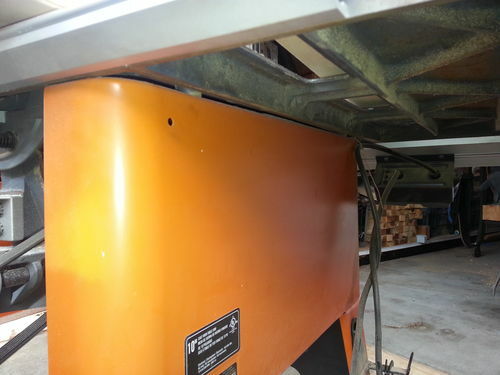 And I wanted the fold-down to cover the motor to stop me from snagging on things rolling it in and out of the shop. After eyeballing, reading the forums, and checking youtube I decided to go with a two part fold-down design. I wanted a short piece for supporting moderate sized pieces, but with a fold-up section to provide support for longer/bigger cuts. 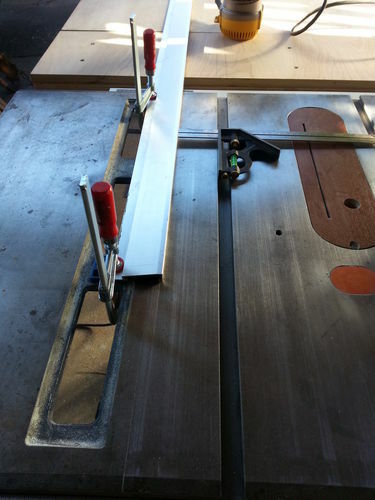 After looking at the way the saw was build I decided to run supports out either side of the saw. This was actually quite handy because the cast iron top and wings provided a good alignment surface, and the saw frame had holes in it already for bolting everything on. The angle adjustment with it’s mounting screws was the only obstacle on the right side. 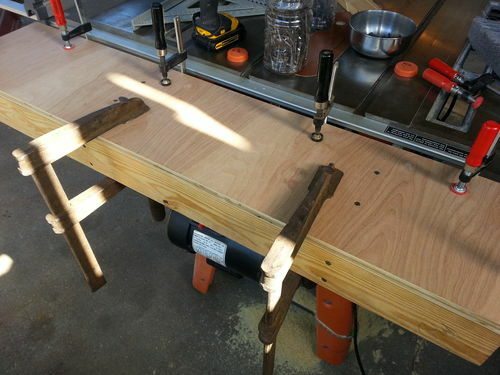 The support for the short table was a couple of pieces of plywood bolted to either side of the saw frame. 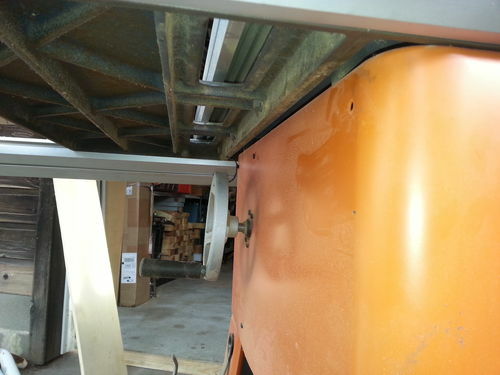 The support arms were long enough that the fold-down would hang behind the saw motor. 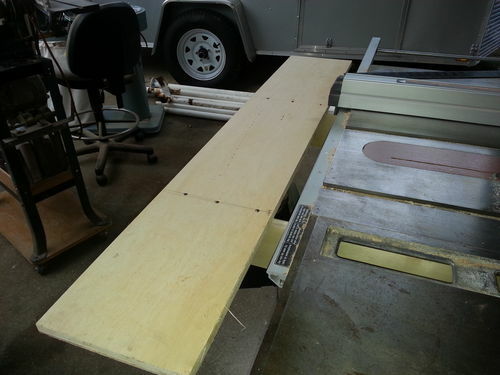 And the short table was gapped to allow the rip fence to track without rubbing. 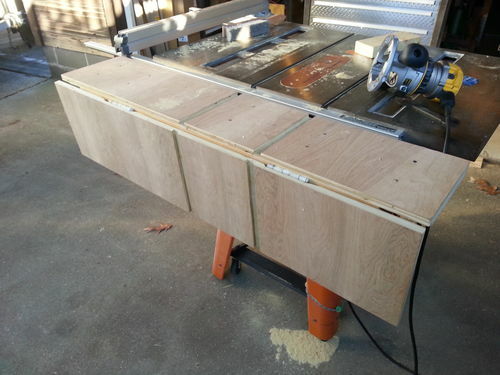 I rabbitted a 2×4 for support of the short extension and to put the hinges on for the fold down. 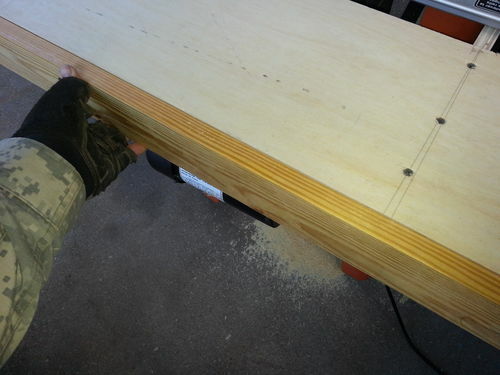 The bottom of the extension was cheap plywood and was also 3/4 inch lower than the table so I put some 3/4 inch cabinet grade plywood on top of that for a better surface. Glued and screwed with some clamps thrown in for good measure. I also wanted the fold-down to be removeable with the idea of a larger outfeed in case I needed it. So I dug through the door parts bin and found a couple of door hinges with removable hinge pins. I went through several head-scratching moments trying to figure out the best way to route the extension slot for the miter fence. In the end I ended up with a moderately sized outfeed table at zero cost that has done the job the couple of times I’ve used it. The shorter part is actually enough support for most of my sawing. I still need to install a support leg for the fold-up part, but a roller stand works well for now. Looks good Pete. I like the drop leaf design. Great space saver. I like your use of plain ole Door Hinges! They are rugged and do a very good job! The logistics of moving your saw in and out is the same as mine so I was most interested in your extension table. It certainly looks the part, so I thought I should do the same, however when I checked out the space there is too much other ‘stuff” there. 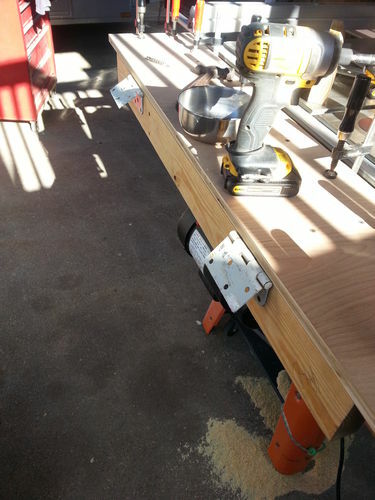 So if I did the same I would not be able to get my saw back in as its a shared area with custom made boxes for electrical equipment that are stored under side of the table overhangs. I crawled about to see what “junk” was there also and found this, dusted it off and thought you may be interested, its me about 25 or 30 YO! Anyway enough of the things I cannot do anymore, so I have been buying some swandown mops and learning how to polish wood after seeing your results. This is my effort today, ...its getting there but see cannot see my face in it yet! Rob, in order of mention in your comment. ?. My saw goes in its slot sideways (end first) so the fold-down isn’t an issue. But I think all is not lost, if you use door hinges or something else that lets you remove the fold-down part then you can keep it somewhere else until you need it. I have a 4 foot and an 8 foot additqion for my RAS that I haven’t ever used, but they are in the back corner if I ever do. BTW I thought MY shop was crowded. That looks like a good LJ thread in itself! 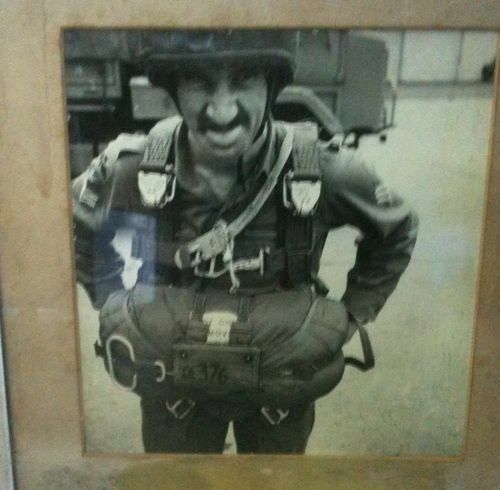 Second, so you used to jump out of perfectly good airplanes….that answers questions I didn’t even know I had about you. But you’re posting so I guess you made it down to earth well enough every time. Third, have fun with the buffing. Each type of wood responds differently, especially the open grains. 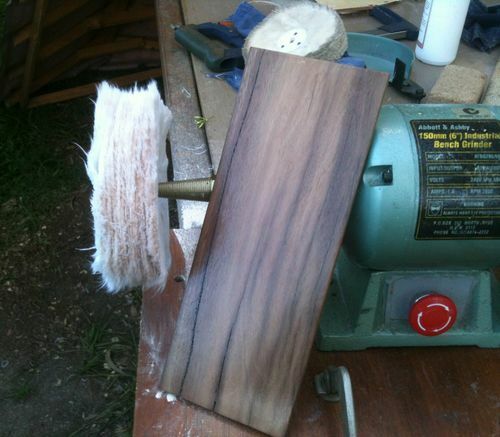 Most of my work gets a thin coat of shellac to seal it before I start the polishing process. Experimentation builds experience. Very neat idea Pete. I like the hinged top. Short and/or long, you got it right there.